I've been trying to write out why this article bothers me, and I feel like I just can't put my finger on it. What do we gain by comparing these two women this way? What point was this article trying to make? That Bristol Palin is a moron? Do they just want to make fun of someone who clearly isn't doing well? 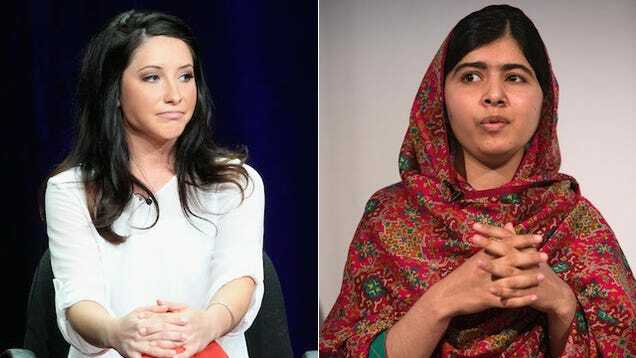 Bristol Palin was mocked by an entire nation for something that happens to teenagers all the time. She has been and apparently still is being used as a political tool, and as fodder for gossip. So what if she wrote a book about it? Why does her story have to be compared to Malala's? Why can't we discuss it as someone coming to terms with, I don't know, being bullied by an entire country, feeling like she has to justify her life? Or does the article just want to make her look like a dumb white girl? I found this article to be INCREDIBLY petty. As I was reading it, while Bristol was the main target, she remains for me, the personification of the ugly and narcissistic American. She has made various choices to put herself in the media eye after her mother did so. She is damaged and easily made fun of. That said, she is emblematic of Americans and how immature we are. Was she the comparison? Yes. Has Malala gotten a lot of press for her amazing acts of courage? Yes. Are they incredibly different? Yes. I see one as the ideal and one as the clown in terms of what we expect from our young people. Bristol is the caricature of American teens--uneducated, stupid, pregnant, beer-drinking, etc. Malala is who we aspire to be. What better way to see he difference than with a side by side comparison. I understand your issue with the article, but understood it in a different way. Perhaps a dissection or discussion of this kind of article would be appropriate for a gender or sociology class.